Although I couldn’t grow a beefsteak tomato in a hundred years in my Seattle backyard, the smallest varieties grow reasonably well in a warm year (read: not this year). So I’ve had the opportunity to get to know and love cherry tomatoes of every color. The reds are reliable, the yellow pears add variety, the purpley-blacks are tangy and sweet. But the loveliest of them all, for both flavor and looks, is the orange-bright Sungold tomato. Use them here if you have them. Grow them next year if you don’t. This is my kind of pasta dish because it’s equal parts vegetables and pasta. You can serve it as a warm pasta or a cold salad. We had it once alongside grilled salmon and another night with other salads and a frittata wedge. It’s vegan all by itself, but nobody would ever notice. I like the poppy, slippery coucous rounds, but nobody will know to complain if you use orzo instead. Israeli Couscous with Zucchini, Sungold Tomatoes, and Basil Oil: Saute a pound of diced zucchini with a diced sweet onion until browned in places and soft, then season with salt and pepper. Meanwhile, cook a cup of Israeli coucous (also called pearl couscous) in plenty of boiling salted water until tender but not mushy, about 5 minutes, then drain and rinse. Add couscous to the pan of zucchini along with most of a pint of halved Sungold tomatoes (or substitute other cherry tomatoes if you must) and several finely-shredded leaves of basil. Spoon a few Tbsp. of basil oil over the pasta. Toss, taste and adjust the flavors, then garnish with more halved tomatoes and basil. 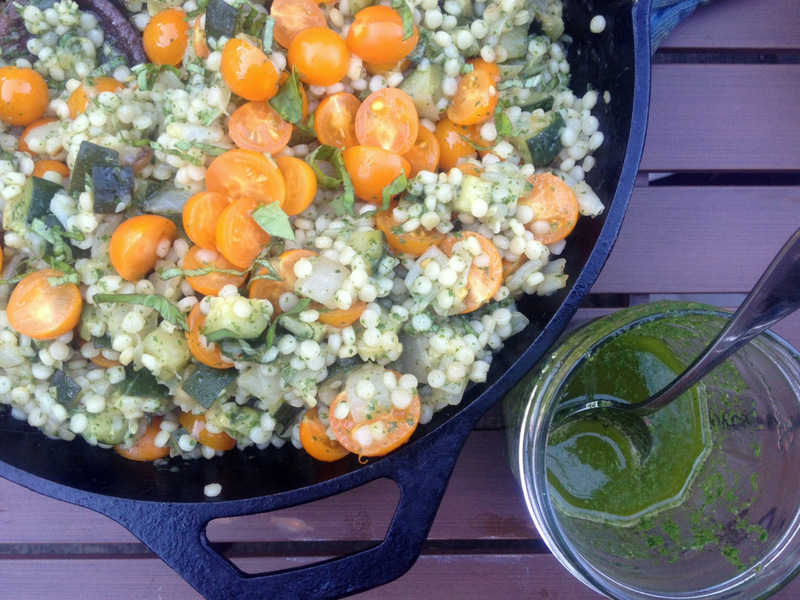 This entry was posted in Easily Multiplies to Feed a Crowd, Emmy Cooks Original, Food, Noodles, Recipes, Salads, Vegan or Would-Be-Just-As-Good-Vegan and tagged Israeli couscous, summer CSA recipes, Sungold tomatoes, tomato recipes, zucchini recipes on August 7, 2012 by emmycooks. This looks delicious and doable for me (read fast and easy). I love the looks of that basil oil that you made the other day too. this sounds divine! i’m on day two of a three-day juice cleanse, but i plan on making this for sure – thanks! Prefect for the season…good recipe.. Perfect for Summer! Looks gooooood. SUNGOLDS are my favorite tomato. EVER. I love how you’ve showcased them in this meal! Yes! This is exactly what I want to eat all summer long. When enough of my sungolds ripen, I’m definitely doing this! Same thing for me…lots and lots of cherry tomatoes. I’m just glad I managed to grow anything! We have the same challenge here in Portland- I always end up with a load of big green tomatoes at the end of the growing season. But the little guys ripen quickly, so this will be a lovely recipe to try!! Looks like the perfect way to use up all the tomatoes and zucchini I’ve got! Great dish Emmy! I am with you – I like equal parts veg to my pasta.